Fixed broadband access networks are undergoing significant change. Access speed requirements are continuing to trend upwards and service providers are continuing to invest in the enhancement of their fixed access infrastructures. Meanwhile, new application delivery models are competing with existing service provider residential services, often resulting in downward ARPU pricing pressure. In addition, there has been an increase in the number of smart devices and appliances within the home, with consumers continuously looking for innovative solutions, which enhance their life style and experiences. Facing these evolving dynamics, service providers are looking at how to increase revenues with innovative services while continuing to lower capital and operational expenses. In today’s networks, residential services are implemented using operator-provided, in-home equipment, including the residential gateway (RGW). This approach often impedes service innovation and velocity due to the complexity imposed by the need to support many RGW device variants. What’s needed is an evolution from existing to new service delivery architectures that drive revenue while being cost-effective and efficient. That’s why service providers are increasingly exploring the virtualization of RGW functions and the possibility of delivering these functions from within the network cloud. 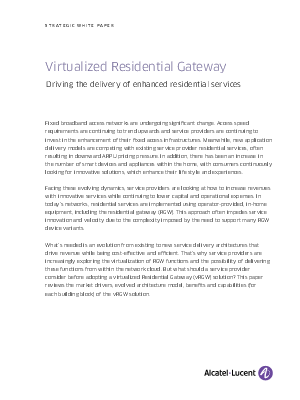 But what should a service provider consider before adopting a virtualized Residential Gateway (vRGW) solution? This paper reviews the market drivers, evolved architecture model, benefits and capabilities (for each building block) of the vRGW solution.